don't know about you but when i get a good book i like to READ it. 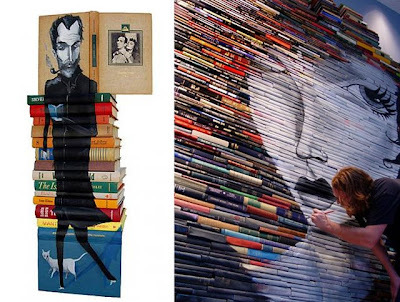 look what these artists are doing to books! Dark Roasted Blend is a site devoted to weird and wonderful things. 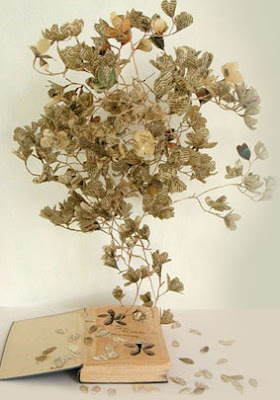 Have a look at the Bitter Sweet Art of Cutting Up Books for more fantastical book sculptures and installations. I love, love the first pick. How amazing is that? I saw something cool on someone's blog where someone turned the yellow pages into a roll,secured with a metal clip, and used it as a business card holder, was very cool. Sorry can't remember the blog. 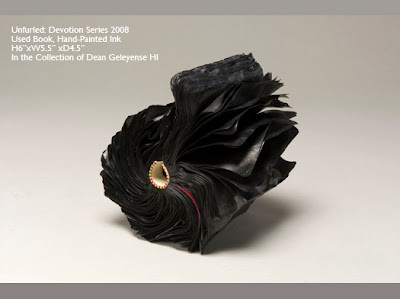 hope you looked at her website, it's full of these amazing book sculptures. wow. these creations things are amazing, and i only feel a little bit sad for the dissected books, because they have been re fashioned into something so special!